Earlier today, I had the pleasure of seeing the third installment in Marvel’s Thor series. 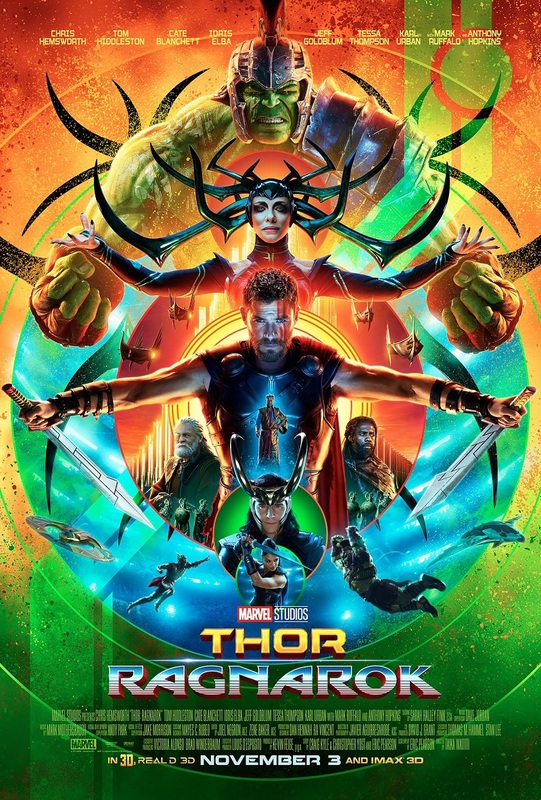 Directed by Taika Waititi of What We Do in the Shadows fame, Thor: Ragnarok has almost everyone head over heels with delight. And they’ve got good reason to be. Ragnarok is hilarious. From its absurd settings, colorful cast of characters, and heart-wrenching ending, this film is sure to please fans of the MCU and nab a few naysayers along the way. Ragnarok‘s best features are its colorful visuals and stunning cast. Viewers would be right to see some favorable comparison to the Guardians of the Galaxy films. Ragnarok has almost as many unique locations populated by vibrant scenery, sets, and people. The previous two Thor films have been fairly muted from a color perspective, either because the locations have been in dark spaces (both films), in Asgard (both films), or in deserts (Thor). Here, the scenery is variable, drifting from Asgard to glorified trash cities to colorful parades and even a little bit of Norway. This lifts the film from its dreary premise (the end of the world, obviously) to give some levity for the eyes. The newest location, Sakaar, is sort of like ancient Rome if it were built on the refuse of a thousand other empires. But it’s also a gorgeous location full of some truly delightful worldbuilding, from its massive city structures to its garbage piles to its gladiator-style stadium and more. Also: the Hulk in a hot tub may be the one weird image you never thought you’d have in your head — and now you will. All of this colorful imagery and worldbuilding leads to a cast that is both surprising and brilliant. If you go into this cold, you’ll notice a lot of actors doing things you never would have expected of them, including one very cringe-worthy (and hilarious) former Megacity judge. Hemsworth gets an opportunity to shine as a comedic actor in a lead role, and he does so with just a hint of “I’m actually having fun doing this.” Meanwhile, Jeff Goldblum’s Grand Master adds so much quirky villainy to the film that you actually start to miss him when he’s no longer on screen. Opposite him is the character pretty much everyone is talking about: Tessa Thompson’s Valkryie. She’s the standout here, and it’s such a shame that she doesn’t get nearly the screen time she deserves. And speaking of women with unnecessarily less screen time: the true villain of the film, Blanchett’s Hela, has the difficult task of creating the overarching narrative tension. Sadly, I was more compelled by Blanchett’s general performance and her costume design than I was with the narrative she presented to us. The film attempts to link her into the Thor family drama, but it does little to elevate her above another “I’m going to destroy everything” villain — of which she is but the second. While she is menacing, I had hoped there would be more to her character. Still, round out the cast with some stealth selections, all sorts of strange and wonderful critters with unique eccentricities, and some familiar faces, and you’ve got near perfection. What I find least pleasing, however, is the sense that the humor comes at the expense of the often unacknowledged depth of Thor’s story. Practically every moment of this film feels like a punchline waiting to be activated, and this has the effect of turning otherwise heartfelt moments into half-measures. The result is a lot of laughter and not enough of everything else. This particularly bothered me because Ragnarok is the third feature-length exploration of the relationship between Thor and Loki.2 What little we do get of the unfinished business between them feels rushed or outright dribbled for the sake of moving the plot forward. When we do get a conclusion, it lacks the justification necessary for it to make sense. It also leaves us wide open to more of the same. Is this dance the only one we can do, or is it possible to get a Marvel movie that finally comes to a conclusion and sticks to it? For all the talk about this film’s approach to family, Ragnarok falls a bit flat. That’s also true of its “big bad,” which is supposed to be “the end of the world” but feels more like “this week’s big monster.” Even the concluding scene, which should be more emotionally damaging felt less like something truly terrible had happened and more like everyone went to get a pumpkin spice latte and couldn’t find a Starbuck’s that had any left. I just wanted a less shallow exploration of the core themes so we could end up somewhere knew in a way that seemed earned. And, yes, lots of his independent films, too. Fourth if you count The Avengers.